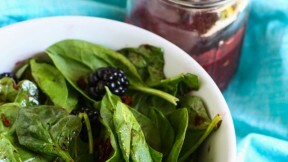 Try this spinach salad recipe topped with candied bacon and blackberry vinaigrette for an extremely flavorful starter. Jenna Weber shares this recipe as part of a full post on the Fresh Tastes blog. Make salad dressing first. In a blender combine the blackberries, garlic, mustard and white balsamic vinegar. While the motor is running, slowly drizzle in the olive oil. Continue blending until mixture is well combined. Season with sea salt and pepper to taste. This will make about a cup of salad dressing---store in a sealed mason jar or Tupperware container in the fridge for up to a week. To make the candied bacon, preheat your oven to 375. Line a cookie sheet with tin foil and then place a rack on top. Place the brown sugar in a shallow dish or on a plate. Swipe each piece of bacon in the brown sugar, really covering each piece well. Then, place each slice on top of the rack on the cookie sheet. Bake bacon for about 15 minutes, until bacon is crisp, dark and beautiful. Let bacon cool completely. When bacon has cooled, chop up roughly with a knife and set aside. Now you’re ready to prepare your salad! Place the greens in a large serving bowl. Sprinkle candied bacon on top, along with slivered almonds and whatever other salad toppings you like. Drizzle with dressing and toss well. Scatter blackberries over top and serve!